Please note we were invited to visit Godstone Farm for a fun family day out and our entrance was complimentary. However, as usual the opinions given here are all my own and are a true reflection of our experience. Recently we were very kindly invited to spend a day at Godstone Farm. We had to reschedule at the last minute due to the threat of torrential rain that never came so last Saturday we got all the paraphernalia required for moving anywhere with four kids and off we went. Godstone Farm is in Godstone in Surrey and is just off the the M25 (about 10 minutes drive) so is easily accessible by car. For us in South West London the trip was just under 1 hour so totally doable for a family day out. As soon as we arrived the kids were excited to be there as were scarecrows on the lead up to the admissions desk and then a smoke breathing dragon head which pushed them up to fever pitch. Once we got inside they didn’t really know what they wanted to do first, but we were given a map and a schedule of events for the day so we decided to do a toilet run and then whilst the children played in a sand pit we checked out what was on that day. 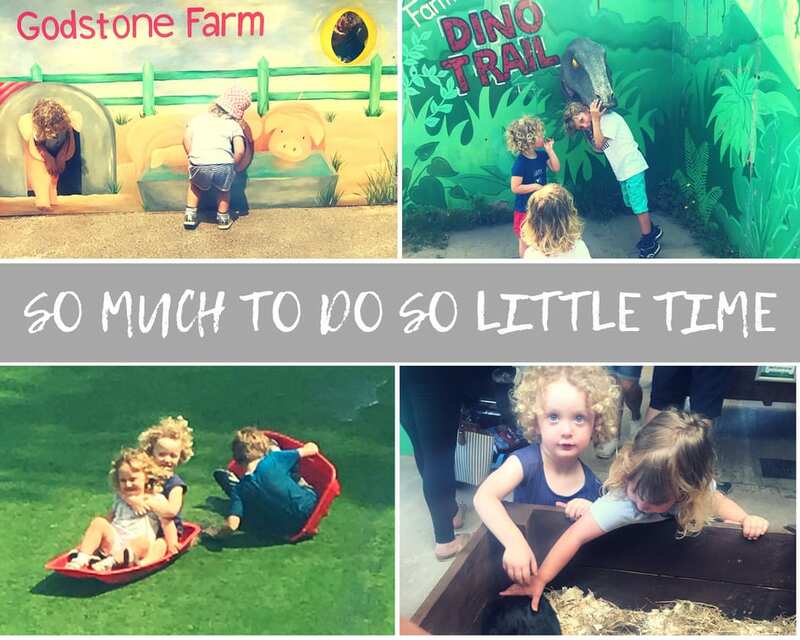 There was lots of choice from Hog racing, to tractor rides, to feeding pigs or ducks and grooming ponies along with their play activities like two sandpits, the most enormous playground and climbing frame, a dinosaur trail and an indoor soft play and lots of others besides. You could probably spend at least an hour of your day doing all of the scheduled activities and there is so much other stuff to do make sure you have allowed enough time. We were there for 6 hours in total and the kids were shattered by the end, but also exhilarated as they loved it all so you can easily spend a full day here. We were lucky with the weather as it was sunny and warm all day. There are undercover activities including the soft play, creature cave (snakes and such like), undercover sandpit area and Wiglets Barn, but they are not all suitable for all ages so if you were planning to go on a very rainy day you might want to wait. A cloudy day or one with a few showers you would still have a great time, but maybe total wash out might not be the best time to visit as a lot of the play opportunities are outside. During half term week Godstone Farm were running a themed event around Fairies and Pirates and so there were some activities linked to the theme going on. The children were on the look out for pirate signs to complete sheet on the way round the farm and we had the opportunity to do Unicorn (Shetland ponies) grooming and attend a Fairy Academy session. It was the first day of the theme when we were there so it may have become more developed over the week because, for us, apart from the fact we met a man dressed as a pirate and went to the Fairy Academy I would say the theme was fairly lost on the children. They started to really engage with the idea of the pirate as he told them the fairies had hidden his treasure and they started to dig for it in the playground, but after that the theme didn’t really continue as much so they lost interest. I think the themes are a great idea though as it adds another element of fun to the day and something different for those who have been to the farm again. I hope they do more of these ideas though and perhaps develop them a bit more. In the summer holidays from the 24th July – 3rd September they are having ‘Festival on the Farm’ I am not quite sure what that entails, but we will definitely be checking it out. 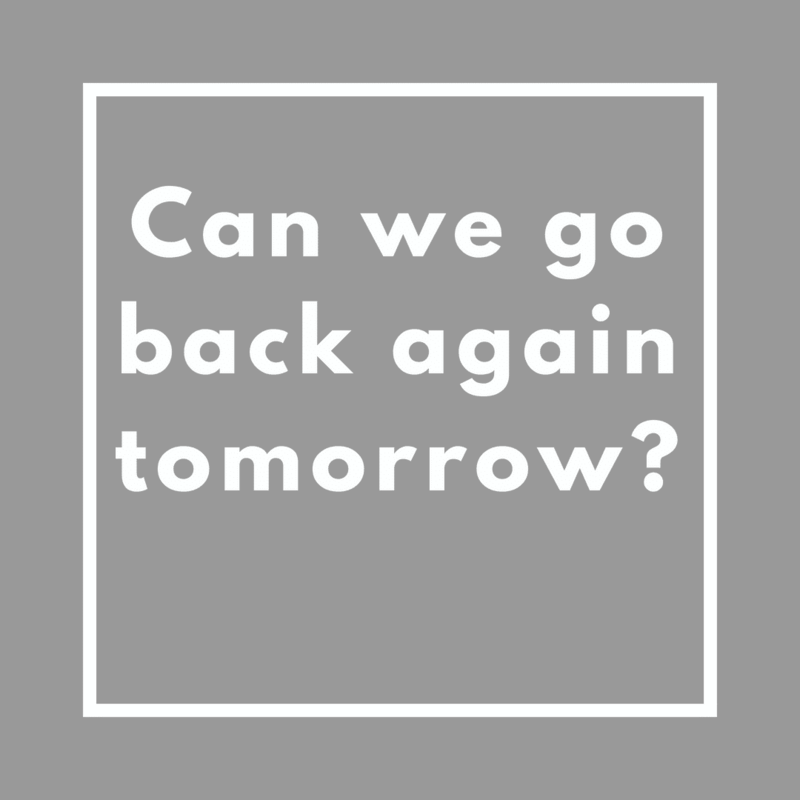 That being said there was so much else to do I am not sure that we would have had time to squeeze in anymore organised activities and my children would have been just as happy if I had left them in the sandpit all day! When we first arrived they spent 45 minutes playing with big trucks in the sand and were entirely engrossed. So much so I felt rather redundant and was getting a bit antsy as I am so used to rushing about after one or all of them…. The husband and I even got to have a conversation so that would make the entrance fee worthwhile for us even if there weren’t loads of other things to do. After eventually enticing them out of the sandpit we bought lunch. As the weather forecast was looking a bit sketchy that day (it ended up being glorious sunshine all day, but had suggested some rain) we decided not to take a picnic, but there are loads of areas where you can picnic and tables provided too. This is great news as I just hate it when places force you to buy their food. To me that always says we will be overcharging you so please get out your wallet and take a seat… Not so at Godstone Farm. I thought the food was very reasonably priced. We had four of the kids boxes – which contained a sandwich, a drink and then a choice of three from items such as jelly pouches, fruit, crisps etc… This was more than enough for our littles and they even ended up keeping their fruit for their afternoon snack. The husband and I had sausage, beans and chips and a drink each. The total came to around £35 and for a family of 6 to have lunch I find that to be fairly standard. I didn’t taste the kids sandwiches, but they had no complaints and I can report that the sausages were great quality. The cafe also serves jacket potatoes, sandwiches, chicken strips and has a great looking salad bar, but I was feeling naughty and the chips were calling me. You can also get pizzas from the ice cream kiosk just next to the cafe. We didn’t try these so I can’t comment, but I tell you just so that you can see there is a good selection of items available. The most vital part of all is that they serve coffee!! It is not the best coffee in the world, but also not the worst and so that works for me!! I did notice that there is another well stocked cafe in the soft play area, but we didn’t need anything then so I didn’t actually look too much at what they served. We also tried to join in with the unicorn grooming and the girls were mesmorised by the shetland ponies, but when it came to standing in the (very short) queue they were not keen so I didn’t actually get to see what the children were able to do. It is such a sweet idea though to allow the children to at least for a minute or two get involved in taking care of the animals. In that barn we also got to see the most enormous pigs and one of them even obliged and did a poo which sent the boys into fits. They do love a bit of toilet humour. From there it was time to divide and conquer as the boys were desperate to go on the massive playground they could clearly see and it seemed a bit big for the girls. So I took the ladies to the animal holding area. They didn’t actually have any animals to hold, but I understand that bunny rabbits get way too hot being held when it is a hot day. Of course the welfare of the animals comes first. The girls were more than satisfied by being able to stroke bunny rabbits and piglets. We then also took in sheep and cows on our way back up to the playground area as we had received an emergency fun phone call from the husband reporting that the boys had found a water slide which we had to come and see. This is actually a hill that has been covered with fake grass with water fountains spraying on the top and toboggans for the children to sit in and slide down. Oh my goodness they loved this – well they did until the girls had a crash with their brother and came a cropper. Be warned if your children start going on this they are unlikely to want to stop for a while and they will end up soaking wet and a bit dirty, but they will also have had a lot of fun so I say pack a spare set of clothes and let them crack on. I had spare clothes due to the weather warnings so we were still set for more fun after they eventually finished sliding. Now to tell you more about this is my eldest who very much wanted to contribute to this post and has been pestering me to write it since we got home. Here is his first ever blog post and a picture of the original version of this text. The toboggan run was very fun because I went very fast and had lots of crashes. The crashes were very fun! When my sisters came they went on the toboggan run and one of my sisters got on the toboggan with me and the other one got on with my brother. Then my sisters crashed into me and I span around. I had a great day!! The boys also loved the playground area and it was tough to drag them away, but we wanted to see the fairy academy. I think we missed the beginning of this as it seemed very short, but the kids enjoyed joining in with the fairy spells and all bar the eldest (who to be fair I don’t think would count as the target audience) were thrilled with their fairy wands that they were given. Next it was onto another hill with little ride ons that the little ones were able to go on whilst mummy and daddy had a caffeine refuel and then we sat on the grass having snacks. Before heading to the soft play barn. This soft play is really well thought out and laid out so you can pretty see where they are the whole time. They had an absolute blast running around in there and it was great for us to see the four of them playing so well together, but it was very hot and stuffy in there so in the height of the summer you might want to give it a miss. The playground is so fab that I am not sure the kids would have minded had we not made it to soft play. They is also an imaginative play barn for littler ones next door to the soft play barn. We didn’t go in there, but I took a few snaps and you can see it is a lovely space for toddlers to explore and play. Finally for us it was the Dinosaur Trail. This is bizarrely the only bit I properly remembered from my last visit to Godstone Farm some 5 years ago as my eldest was really into dinosaurs and so much of my day was spent looking for bones in the sandpit. This time it was the end of the day and the kids were all a bit hot and bothered so it was a quicker trip around than previously. They were asking the husband tricky dinosaur questions and correcting him as of course they know better – don’t all 5 and 7 year olds? They loved this an an extra element. I said finally for the Dino Trail, but of course no trip anywhere is complete without a trip to the shop. There are some lovely things in the shop including books, bug collecting kits and farm yard related toys, but I did feel that there was also a lot of stuff like knights shields that didn’t really relate to the farm and that I therefore didn’t really want to buy – cue a lengthy disagreement with my son. Eventually we settled on pirate gear, a bow and arrow set and ponies for the girls. I would have preferred to have bought something farm related that they could have learnt something from, but they were having none of it…. I did however, get the most fabulous train whistle which is so great for catching the kids attention when out and about meaning I may be able to stop hollering like a fish wife on the school run when the scoot to far away! I also picked up a couple of great toys to take on holiday with us so I can surprise the kids with them there. I thought the gift shop was very reasonably priced and that is really rare for somewhere that has essentially a captive audience so good on Godstone Farm for taking this approach. I honestly think that if a venue has reasonably priced, good quality items and food you begrudge spending money so much less that you probably in reality spend more. Now if that isn’t an ringing endorsement I don’t know what is…. So once again thanks to Nicola, for inviting us to visit Godstone Farm and for wearing out my four little bundles of energy. It really is a fun family day out. We loved it and will absolutely be back soon!